Come see for yourself. Our students, classes, and activities are the heart of the MBA experience. Schedule a visit to learn about the admissions process, attend classes, meet current students, and get a firsthand look at our diverse and collaborative culture. Advance registration is recommended, although not required. Please note: Participating in a campus visit has no bearing on an applicant’s admissions decision. The 2018-2019 Wharton MBA Campus Visit Program will take place every Monday, Wednesday, Thursday, and one Friday per month, from September 2018 – April 2019. Check out our event calendar for exact dates. Campus Visits will not take place during university breaks, national holidays, and MBA interviews. If a visit is canceled due to inclement weather, you will be notified via email. The final visit day for the 2018-19 academic year will take place on April 17, 2019. Please Note: You are not required to select every activity available on your Visit Day. Please choose only those that are of interest to you. * The Lauder MBA/MBA Program and The Carey JD/MBA Program offer class visits and information sessions. Please see the tab below for exact dates. * We offer small group diversity chats for prospective students from many underrepresented backgrounds. Please see the tab below for exact dates. Please Note: Not every activity is offered during a Campus Visit . Please see the schedules above to make sure your preferred activities are available during your Campus Visit . Meet and Greets are an informal opportunity to meet with current students and ask questions about their Wharton experience. This is a good opportunity to get some feedback about which class visit might best suit your interests. Meet and Greets will take place in the admissions lobby. Observe Wharton’s collaborative learning environment first-hand. The class list will be posted when you arrive on campus, and classes are on a first come first serve basis. For fairness we do not let prospective students choose which class they will attend prior to coming to campus. This allows us to make sure that you will make it to class on time. We also do our best to understand when exams are taking place or when a class is not meeting. 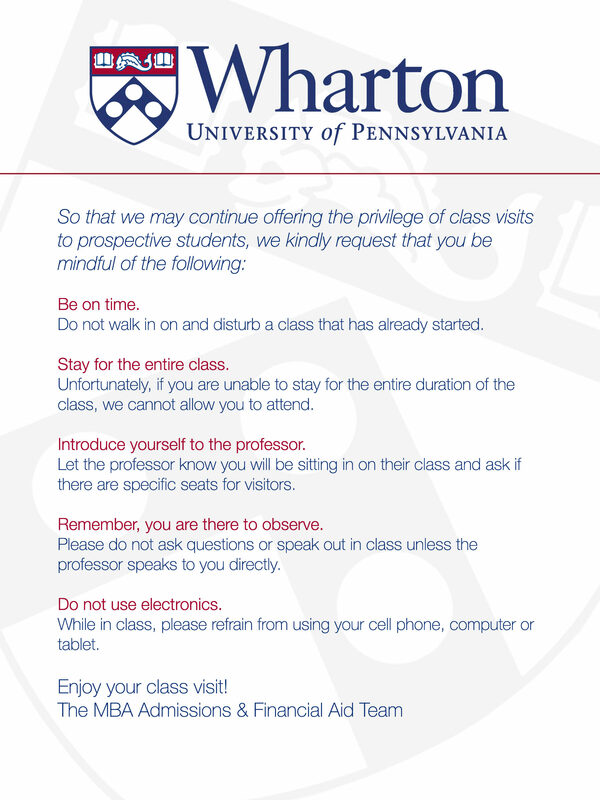 Before attending your class visit, please read over Wharton’s Class Etiquette Policies. Please Note: You must check-in with the MBA Admissions Office at least 15 minutes prior to the start of class to be able to attend a class visit. To visit Lauder on another date, or to sit in on a language classes, feel free to reach out to the Lauder office directly. Take a brief tour of Wharton’s campus, led by current students. The tour will be followed by a Q&A session with lunch voucher provided on Mondays, Wednesdays, and Thursdays only. The tour departs from the MBA Admissions Office. Join current Admissions Fellows for a presentation that will highlight the Wharton MBA Program and application process. Join Kelly McLaughlin, Director of the Carey JD/MBA Program, who will share highlights of the three-year joint degree program and answer questions about Wharton, Penn Law, and the JD/MBA application process. Join current MBA students from underrepresented backgrounds for a group chat to discuss personal perspectives of the Wharton experience and speak to the value of an MBA as members of historically and traditionally underrepresented communities. I would like to visit the campus on a day when there is no campus visit program. What is there for me to do? There are no activities that we can offer on days when there is not a formal visit day scheduled. However, you are welcome to pick up a self-guided tour pamphlet and there will be a representative at the front desk who can answer questions you may have about the program and/or application process. Am I able to connect with a current student prior to my visit day? Prospective students are welcome to connect with an Admissions Fellow by emailing admissionsfellows@wharton.upenn.edu. Can I schedule a meeting with one of the Admissions committee members? As the demand for meetings with admissions committee members far outstrips our ability to provide them for all interested applicants, we are unable to schedule meetings with our admissions team. Am I able to attend a class if I visit on a Friday? No, MBA classes are only in session Monday-Thursday. I plan to drive to campus, where is the best place to park? The closest parking lot to our building is located at 38th and Walnut Streets. Directions and prices for all on-campus parking lots can be found here. We are unable to validate parking. I will be coming to campus from the train station/airport; will there be somewhere to put my luggage while I am visiting campus? Yes, we have a secure room to store your luggage in the Admissions Office on the first floor of Vance Hall, Suite 111. For any other questions, please contact us at 215.898.6183 or mba-admiss@wharton.upenn.edu. Register for a Visit Today! Prospective students are also encouraged to explore the University and the city of Philadelphia on their own. Learn more about what Philadelphia has to offer.